e-Therapeutics’s new CEO, Dr Raymond Barlow, has completed a strategic review and is refining the company’s approach as it looks to commercialise its leading position in the field of network-driven drug discovery. It is focussing its resources on the two immuno-oncology drug discovery programmes, and on advancing the discovery platform. The potential of the company’s discovery engine was reviewed and subsequently endorsed by a panel of independent experts, which bodes well for the company as it looks to form drug discovery collaborations. Our DCF-based valuation remains at £53.8m or 20.4p/share. Source: Trinity Delta Note: Adjusted numbers exclude share – based payments and exceptionals. Review leads to change in emphasis The past 18 months have seen a major transformation as a comprehensive review resulted in changes to senior management, a greater commercial focus, and a material shift in strategy. The research efforts are now channelled into maximising the capabilities of the drug discovery platform to generate innovative drug leads, with work on the sub-optimal, and expensive, clinical programmes discontinued. A novel drug discovery platform Network-driven drug discovery initially identifies protein sets within a disease network for drug intervention, and subsequently compounds that could significant affect those protein sets. The approach is feasible because of recent advances in fields such as network science, disease modelling, large-data handling and knowledge extraction. The techniques also offer the potential to generate novel, non-obvious, and highly efficacious drugs. External validation is now required Investment over the past five years has transformed the platform from essentially an academic project into a robust and scalable industrial tool. A number of internal programmes have successfully validated the concept, but the real test will be how the pharmaceutical industry responds and the level of partnerships and collaborations. Although striking such deals will inevitably take time, the new CEO has an impressive track record in business development. as we use a simple rNPV model based on four collaborations. This generates a value of £53.8m, equivalent to 20.4p/share, with significant upside associated with a collaboration deal. e-Therapeutics is a drug discovery company with a proprietary network- driven drug discovery platform. Following management changes and a strategic review, the focus is now on optimising its discovery processes and securing industry collaborations and partners for its projects. e-Therapeutics is a UK-based drug discovery company. It was founded in 2003 as a spin-out from Newcastle University and listed on AIM in November 2007 (raising £1.33m and with a post-money market cap of £37m). Since then it has developed its proprietary network analysis technology into a novel discovery platform. e-Therapeutics has raised a total of £63m in equity, with the most recent, a £40.0m gross (£38.9m net) share issue in March 2013, also being the largest. Following a strategic review the company now employs around 20 staff, with most working in the facility outside Oxford. The more recent investments made in upgrading the discovery capabilities appear to be paying off, with a stream of promising leads emerging. These are expected to be partnered, either via collaborations or out-licensing, ahead of the clinical stages. Valuing a pre-clinical drug discovery company is not straightforward, irrespective of the novelty, quality, and attractiveness of its technology platform. Typically we would use an rNPV model to ascribe value to each clinical pipeline project, with little value given to pre-clinical assets. Since e-Therapeutics’ revised strategy is to collaborate on and/or out-licence programmes ahead of the clinical stages, an alternative method is needed. We have opted to use a simple risk-adjusted DCF model based on four deals over the next four years. Although arguably less robust than our usual methodology we have, in line with our philosophy, employed conservative assumptions throughout. This results in a valuation of £53.8m, or 20.4p per share, and we note that the successful execution of a collaboration deal could result in a material increase as the risk adjustment is reduced. e-Therapeutics is funded with a cash position of £14.0m on 31 January 2017 and, following the decision to wind down its clinical programmes (ETS2101 and ETS6103), has capital to invest. It should be able to operate into 2019, while maintaining investment in its core discovery platform and certain programmes, and provide it with sufficient time to start generating a return on its drug discovery platform. Unusually, the typical industry risks of clinical trial failure, regulatory hurdles, and ensuring appropriate pricing and commercialisation don’t apply. The main sensitivity relates to the success of the drug discovery platform in generating a stream of innovative and valuable product candidates. However, the key near-term sensitivity is the rate at which collaborations and licensing deals can be struck, and their financial terms. Management’s ability to successfully execute the business plan is also a crucial consideration. The net cash position means the cash runway extends to beyond the first of the expected value inflection points. e-Therapeutics has undergone a material transformation over the past year; with management changes and a strategic review resulting in the focus being shifted firmly onto the drug discovery platform. The move recognises the progress that has been achieved and the possible value that could be created if the promising early results translate into a reproducible stream of collaborations. The company remains funded through to several likely value creation points; however, it needs to marshal its resources carefully to generate the necessary data to maximise the likelihood and terms of potential deals. Our risk-adjusted DCF-based model results in a valuation of £53.8m (20.4p/share), which should rise materially on the formation of a collaboration. The last 18 months has seen a striking shift in emphasis as the conclusion of an initial strategic review culminated in management changes. e-Therapeutics remains committed to network-driven drug discovery but, tellingly, the research focus has swung away from the clinical development of existing products that have been re-purposed for alternative indications and onto the generation of novel small molecules that better embody the platform’s potential for insightful innovation. The shift is coupled with a greater commercial awareness and a more rigorous, and professional, approach to resource allocation. 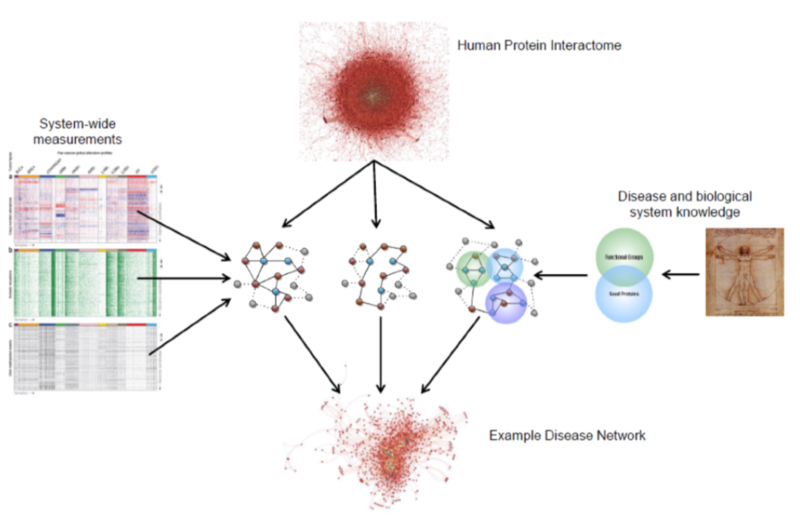 Network-driven drug discovery identifies important nodes within a network disease model that might serve as protein sets for pharmaceutical intervention and develops drugs that significantly affect those protein sets, either directly or indirectly. The hypothesis is that to have a clinical outcome, interventions in complex biological networks need to be highly selective and carefully targeted to disrupt efficiently a disease network. The network-driven drug discovery process is still evolving as technological advances such as machine learning, artificial intelligence (AI) and network science begin to impact on mainstream disciplines, yet its ability to augment and leverage current practices is clear. The £40m equity raise in 2013 allowed significant investment to be made in upgrading and optimising the platform, transforming it from essentially a fascinating academic project into a robust, reliable and scalable industrial tool. The platform has been validated internally using several different disease and target areas; however, the real test will be whether meaningful external collaborations can be struck, and their terms. The new CEO, Dr Ray Barlow, has an impressive track record of business development within the industry and his first priority will be to crystallise the platform’s commercial potential. Valuing a business with only pre-clinical assets is never straightforward. Inevitably a greater degree of subjectivity than normal is required but clearly the space is attractive and gaining increasing investor attention. Fortunately for us, with £14m net cash at the end of January 2017, e-Therapeutics is adequately funded to invest in some internal projects and has the runway to create value from its proprietary network-driven drug discovery platform. e-Therapeutics was founded in 2003 to exploit the potential of network-driven drug discovery, NDDD, based on the innovative academic work of Professor Malcolm Young. The company has completely redeveloped its initial platform over the last five years to take into account the advances in understanding complex systems and biology, with Dr Jonny Wray (Head of Discovery Informatics) leading its development. The new discovery engine has been validated on a number of projects in different fields of biology and now appears ready for commercialisation. 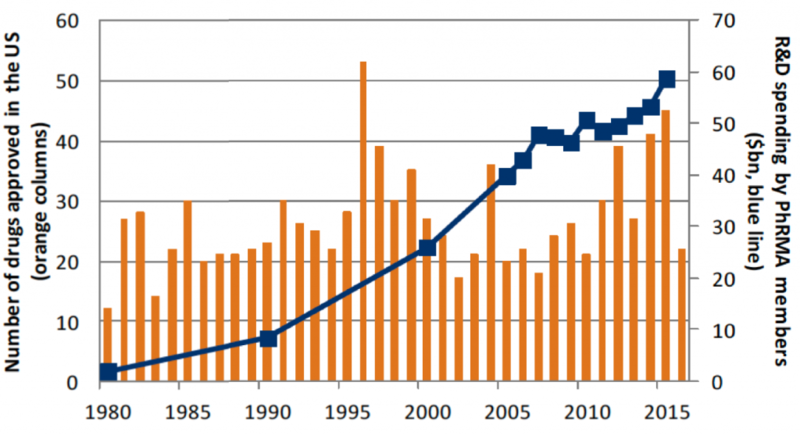 The pharmaceutical industry, as is well known, has faced the issue of declining R&D productivity for many years, with increasing investment in R&D not resulting in more drug approvals (Exhibit 1). For many years, it was believed that advances in high throughput screening combined with combinatorial chemistry would solve the problem. Unfortunately, the decline in R&D productivity has continued and is now worse than ever, even with the increased use of biomarkers. The Tufts Center for the Study of Drug Development estimates that the cost of bring a drug to market, after taking into account failures and capital costs, was $0.8bn in 2000 and that this has now risen to $2.9bn. One of the reasons for the decline in R&D productivity is the complexity of biological systems, which are robust and able to withstand minor perturbations, and there are already drugs against many of the more obvious druggable targets. Consequently, the simple high-throughput screens used initially to identify compounds of interest are not suited to addressing the complex cellular environments of diseased tissues and even the more complex in vivo preclinical models rarely replicate a disease state precisely. Associated with this, the selection of binding targets without explicit consideration of their downstream network effects has unpredictable consequences on the disease state of a cell. And yet most drug discovery efforts are solely focused on modulating a single protein without fully considering the wider consequences of that interaction. To overcome the challenge of identifying compounds that optimally affect robust, complex biological systems, e-Therapeutics decided to use big data analytics with machine learning to identify compounds capable of significantly disrupting biological networks. This approach is ambitious, and promises to generate innovative drugs. e-Therapeutics was a pioneer in the application of an in silico approach to drug discovery. The proliferation of biological data since the genome project has further advanced the use of in silico platforms with many companies now using artificial intelligence (AI) and machine learning in this field. These include Berg, which has two products in clinical development in oncology indications, and BenevolentAI, which has acquired the rights to a number of Janssen’s (Johnson & Johnson) novel drug candidates and already has a valuation of $1.7bn (having been founded in 2013). The majority of these companies have developed systems of analysing big data to recognise previously unseen correlations and identify potential novel targets and compounds, using biology subsequently to select the most promising projects. e-Therapeutics is different as it uses similar techniques to disrupt disease networks with novel drugs. e-Therapeutics essentially carries out three in silico processes during a drug discovery project, which are based on a comprehensive understanding of disease biology and the identification of intervention strategies (see Exhibit 2). Following the selection of potentially active compounds in silico, e-Therapeutics follows the more traditional process of drug discovery with phenotypic screening and hit-to-lead optimisation. It should be noted that e-Therapeutics’ methodology is distinct to that of its competitors, as it is hypothesis driven and incorporates all the known biological information of a disease state. This is used to develop complex network models of the cellular basis of that specific disease for each drug discovery project. This method is complementary to traditional drug discovery methods and takes into account the multi-factorial aspects of many disease states. Additionally, and in contrast to most others, e-Therapeutics discovers new chemical entities (NCEs); whereas many companies in the field develop repositioned drugs. e-Therapeutics only models the interactions associated with a disease, so that it is focused on identifying compounds that specifically target those disease mechanisms. To develop the initial models it integrates data from over 20 sources, which is then augmented by machine learning algorithms to generate proprietary data. Our knowledge of cell biology remains incomplete, so even with modern computing capabilities it is not possible to model accurately all the interactions of proteins within a cell. It is also worth bearing in mind that each cell type expresses a different set of proteins and has a unique network of interactions, so there would be little benefit of attempting to accurately model too extensive a network. The computational modelling of the disease networks does not require complete, accurate knowledge of every interaction. Complex computational systems can be designed to fill in for gaps in knowledge. Similarly, there are often material differences of opinion as to which proteins might interact and how. e-Therapeutics’ modelling has been developed to take these types of “noise” into account. It normally takes 1-3 months for e-Therapeutics to develop a new disease model, though this can vary depending on how readily available the knowledge of and the biology associated with a disease is. The company’s software architecture also has a modular format so that it can be updated to reflect new computational techniques or biological knowledge as it arises. Once a disease model has been established, the company analyses the best ways to disrupt the specific network. Traditionally, drug discovery has focused on inhibiting a specific pathway, without necessarily considering the impact of that change on other networks or the importance of the context in which the inhibition is occurring. For example, AstraZeneca almost discontinued development of its Parp inhibitor, olaparib (Lynparza), following disappointing Phase II data in ovarian cancer, until it understood that it was only active in patients who had BRCA mutations. In contrast, e-Therapeutics looks at disrupting the entire disease network, taking into account the context of the disease. Having identified which interactions need to be disrupted ideally to destabilise a disease network, it looks to select compounds that affect a selection of proteins in such a way that it disturbs the networks as desired. e-Therapeutics takes advantage of the fact that compounds have multiple effects on proteins. A compound can sometimes bind to more than one protein, and each binding can lead to a cascade of “downstream” effects on other proteins. The broad impact of a drug, beyond that on a specific target protein, is often viewed as a negative in drug discovery. In the case of multiple binding, this is because of the off-target effects and potential unwanted side effects; and with downstream effects because of their complexity, but e-Therapeutics looks to use these occurrences to its advantage. During this final part of the in silico process, e-Therapeutics screens its library of c 10m compounds and scores each of them according to the calculated impact that each one is expected to have on the network (Exhibit 4). The selected compounds provide a starting point for the medicinal chemists to produce NCEs and not just repositioned drugs. Theoretically, it would be possible have a greater impact on a network by combining more than one compound. However, the challenges of taking combination products through the regulatory process, and then to the market, mean that currently efforts are channelled into selecting compounds based on the effect they are expected to have individually. Once the potentially active compounds have been selected using the in silico methods, e-Therapeutics follows a phenotypic medicinal chemistry approach of traditional drug discovery. The chosen compounds are triaged to remove any drugs already known to be active in the disease of interest or those that have very broad non-specific effects. The remaining products undergo phenotypic screening to confirm their activity, with the most promising compounds going through the cycle of lead optimisation by medicinal chemists and further phenotypic screening with DMPK (drug metabolism and pharmacokinetics) screening until a small number of compounds are selected for the formal preclinical process ahead of clinical development. Accelerating the drug discovery process. It takes around two years for e-Therapeutics to select a lead candidate for preclinical testing compared to four years, on average, with high-throughput screening and other techniques. More efficacious therapies. Network-driven drug discovery aims to generate compounds that more completely disrupt disease states and are less likely to lead to drug resistance, whereas the traditional approach tends to only focus on what is achievable via a single drug-protein interaction. Offers a way to potentially address undruggable targets. By disrupting a disease network, it should be possible to affect the activity of targets that are currently undruggable. Bringing in additional novelty. Through the identification of non-obvious targets and compounds that other methods could miss. Rapid pre-selection screening. Providing a system of filtering large compound libraries ahead of complex phenotypic screening. For some therapeutic areas it is not always possible to create a meaningful assay that is amenable to high-throughput screening as the disease biology is so complex. In such a case, e-Therapeutics could identify the most promising c 1,000 compounds from a library of millions, which could then be screened in the complex phenotypic assay. Clearly, the investment case for e-Therapeutics rests on management’s ability to translate these promising features into a reproducible stream of collaborations. To test the potential of the discovery engine, e-Therapeutics carried out discovery programmes in six distinct therapeutic areas. 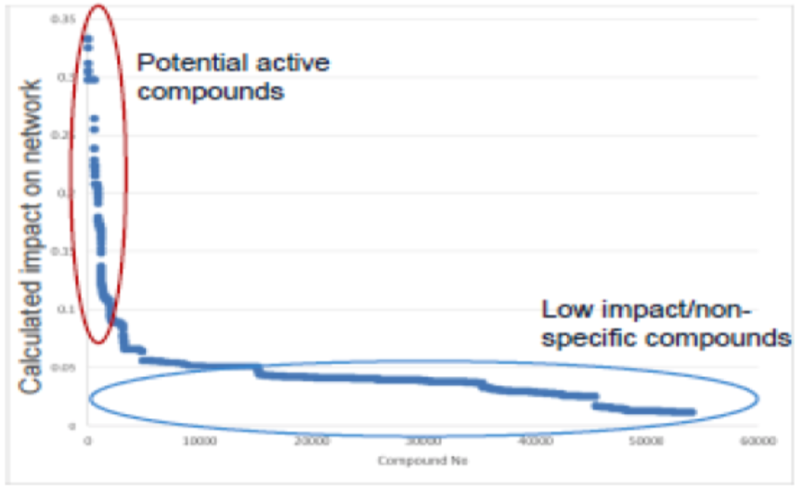 In all cases, the potentially active compounds identified by the in silico platform were clearly enriched with compounds that showed meaningful activity in challenging phenotypic screens (Exhibit 5). The platform was also found to identify a variety of chemotypes. These data confirm the broad applicability of the platform. e-Therapeutics has only disclosed limited detailed data on the various programmes for competitive reasons. That said, there is data from the Hedgehog signalling programme, which provides confirmation that e-Therapeutics’ platform can be used to develop novel, active compounds and evidence of the benefits of network-driven drug discovery. The Hedgehog signalling pathway is well known to be associated with cancer, and there are two drugs already on the market, vismodegib (Erivedge) and sonidegib (Odomzo), which bind to the GPCR protein Smoothened (SMO). They are both approved for the treatment of basal cell carcinoma, and can produce dramatic short term responses. However, patients can relapse after a short time as resistance to the drug develops, often caused by mutations to the SMO protein. would be at least as potent and have comparable DMPK (drug metabolism and pharmacokinetics) characteristics to vismodegib and sonidegib. The company reports that it achieved all of its objectives and some of the results are detailed below. From e-Therapeutics’ analysis of the Hedgehog pathway, it identified 1,146 compounds that it could buy that would potentially disrupt signalling. Reassuringly, sonidegib and other preclinical Hedgehog pathway inhibitors were identified during this analysis. Of these, 254 molecules (22%) were shown to be active, without being cytotoxic, in the C3H10T1/2 cell differentiation assay (Sonic Hedgehog causes these cells to differentiate into osteoblasts if inhibitors are not present). An additional level of screening showed that 63 of the 254 compounds inhibited Hedgehog signalling at <10μM without binding to SMO. Consistent with a goal of the programme, the company was able to generate NCEs using medicinal chemistry, based on the initially identified hits. Exhibit 6 (compound structures not published) shows how the characteristics of two known compounds could be combined to produce novel drug candidates, with the process of lead optimisation creating Lead Compound B with promising characteristics -nanomolar potency (IC50), size (MW, molecular weight) and other measurements including ligand-lipophilicity efficiency (LLE). 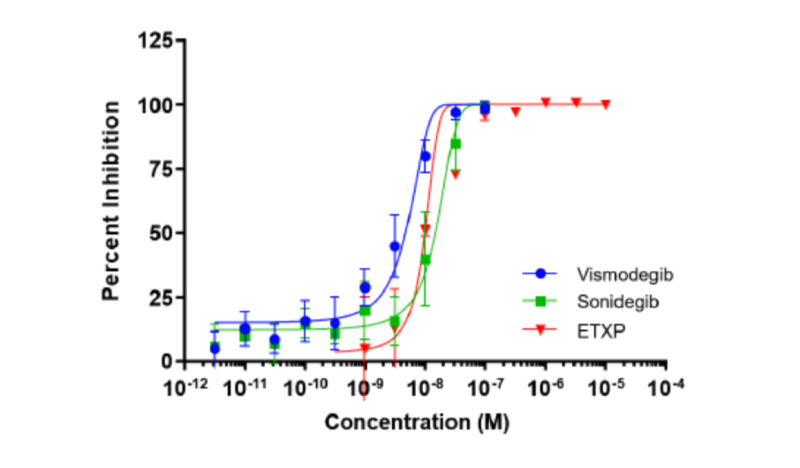 e-Therapeutics also showed that it was able to create novel compounds that had comparable potency to vismodegib and sonidegib in the C3H10T1/2 in vitro model (Exhibit 7). e-Therapeutics was also successful in generating compounds that inhibited hedgehog signalling, even in cells resistant to vismodegib. The new compound was shown to maintain better activity than vismodegib when SMO was modified to have the same mutations found in basal cell carcinoma cells resistant to the SMO inhibitor (Exhibit 8). This finding supports the view that e-Therapeutics can identify compounds with greater sustained efficacy by targeting disease networks. Source: e-Therapeutics; Note: L416F SMO and D477G SMO are cell lines in which the SMO protein has the same mutation as those found in basal cell carcinoma cells, which are resistant to vismodegib. A strategic review is currently being undertaken of the different discovery programmes to decide which to progress further using internal resources. During this process, the management is assessing the progress of the programmes and the potential commercial interest from pharmaceutical companies. The discovery programmes undertaken demonstrated that e-Therapeutics’ discovery engine can be used to identify novel drugs with the desired biological activity. Having said that, there are still improvements that can be made to increase its value and the company continues to invest in the platform. Currently the platform is able to screen a library of over 10m compounds and this compares favourably to those used by major pharmaceutical companies for high throughput screening. However, there is limited data on the proteins with which a drug is able to affect. e-Therapeutics is presently exploring multiple computational techniques, including machine learning and AI (artificial intelligence), to assist in completing the missing data. The company is also developing proprietary techniques and data to address approaches to drug discovery that are only possible using network-driven drug discovery. For example, it is looking to address complex areas of disease biology, such as gene regulation. Modulation of gene control has long been considered a potentially attractive area for drug discovery, but transcription factors have so far proved to be undruggable. The company believes that its network-based approach should enable it to target regulation via the construction and analysis of regulatory networks. e-Therapeutics is operating in an increasingly competitive field of drug discovery and AI, and it is vital that it maintains its leading position in the area. This involves improving the quality of the potential actives that are identified and also developing further the way that it models complex biological systems. 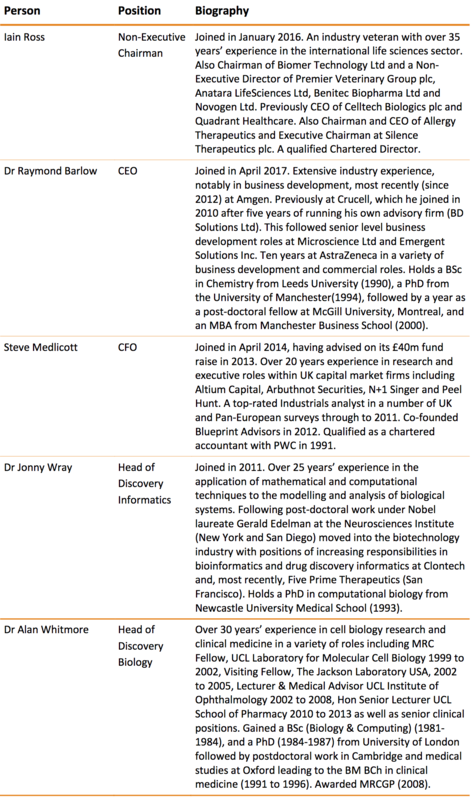 The key task of Dr Ray Barlow, having joined the company in April 2017, will be to define the business strategy and to form collaborations with pharmaceutical companies to commercialise the investments made over the last five years in the new discovery platform. The internal programmes, in our view, confirm the potential of the platform, but it is yet to gain external validation. Dr Barlow has an ideal background as he was previously executive director of corporate development at Amgen in Switzerland, and has held similar positions at AstraZeneca, Crucell (Johnson & Johnson) and Emergent Biosolutions. He also worked in drug discovery at AstraZeneca. Hence he is well versed in the field of business development, has a proven track record of executing deals, and has credible knowledge of the intricacies and challenges of the discovery process. To identify innovative targets/drug candidates in a given area. To gain access to e-Therapeutics’ proprietary data on areas of disease biology or compounds. e-Therapeutics has already implemented appropriate firewall systems to ensure any client data is secure. This means that any potential partner can safely ask for e-Therapeutics to generate models and subsequently identify compounds based on the partner’s knowledge of a disease and compound library, without risk of its proprietary knowledge getting into the hands of a competitor. e-Therapeutics might also be able to partner the discovery programmes that are currently ongoing (or use them to seed broader collaborations), although additional data might be needed to make them attractive to potential partners. We would anticipate that any deal would be structured with an upfront payment and milestone payments based on e-Therapeutics achieving certain objectives and subsequently various development/regulatory events. There might also be an element of fee-for-service work, although we would expect this to be a minor part of any agreement, so that e-Therapeutics’ objectives are fully aligned with those of its potential partner. It is very difficult to assess the value of any potential contract, and ultimately it will depend on the importance of e-Therapeutics’ technology platform to a pharmaceutical company’s discovery programme. At this stage we estimate that the NPV of the first deal could be c £15m, with subsequent ones worth between £25m and £50m. Following the strategic review and decision to focus on maximising the potential of the drug discovery platform e-Therapeutics is no longer exposed to the usual risks associated with drug development, namely clinical trial failure, patent litigation, and regulatory uncertainties. Paradoxically, even though the success rates with pre-clinical compounds is low, because of the materially higher costs of a failure in the clinical stages it means that the overall risk profile is lower. Future licensing/collaboration deals Commercialisation of the platform is dependent on securing a stream of partnerships and collaborations. To date none have been struck and it will surely be one of the new CEO’s priorities to secure a number of such deals. These not only provide external validation of the platform but also give a useful insight into whether the financial terms that are assumed in our model are realistic or too conservative. Usefulness of the platform’s output The platform has shown promise in generating innovative drug candidates in a number of internal programmes. Whilst these are encouraging, the true test will be delivery of acceptable outcomes for a partner’s programme. This effectively provides proof of concept for the platform and allows a truer assessment of its value and that of the portfolio. IP position e-Therapeutics has a multi-layer IP strategy, having filed numerous patents covering the platform (some in the process of being granted). The acquisition of Searchbolt in 2016 for £2.3m also materially strengthens the patent library. Nonetheless, as is common in this field, litigation risk remains an ever-present sensitivity. Novel technologies may supersede The platform has shown a number of promising outputs in computational and preclinical models. However, the space is attracting new players who are employing different technologies in their drug discovery efforts. There is a risk that these unrelated efforts may progress more quickly and displace network-driven drug discovery as a tool. Presence of major investors Four sizeable institutions own over 80% of the outstanding shares. On the one hand this is reassuring; on the other it does hamper liquidity and if such a major shareholder seeks to exit its holding, the share price could be adversely affected. These risks, whilst tangible, are in our view containable. Importantly, the company is well funded and should have ample funds to progress its revised strategy and demonstrate the platform’s utility. The strategic decision to eschew the development pipeline and focus on maximising the capabilities of the drug discovery platform has made our valuation process arguably more difficult, less rigorous, and also, to a degree, more subjective. Typically we would employ a rNPV model to ascribe a risk-adjusted value to the various elements of the clinical pipeline, discounting these back and making the necessary adjustments for costs, net cash, and tax credits where appropriate. Since e-Therapeutics’ revised strategy is to collaborate on and/or out-licence programmes ahead of the clinical stages, the earlier stage of the discovery process does not lend itself to this approach. Hence, as an alternative method we have employed a simple risk-adjusted DCF model. As always, we employ conservative assumptions and have only valued four potential deals assets as shown in Exhibit 9. 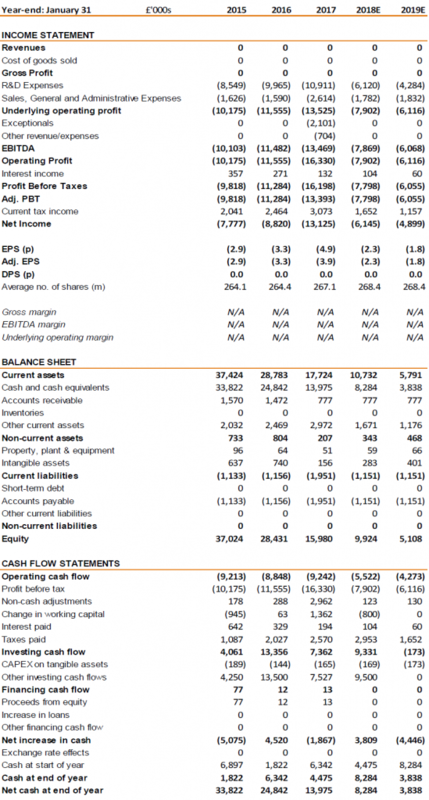 The model suggests that e-Therapeutics is currently worth £53.8m, equivalent to 20.4p a share. We assume that deals are based on the current technology platform, including only core operating expenses (100% of SG&A and 25% of R&D expenses; the rest of the investment in R&D assumed to have an NPV of zero). Clearly as progress is achieved, notably an external partnership or collaboration, we would expect our valuation to increase significantly as we reduce the level of risk-adjustment, depending on the values of the potential deals. As the visibility of the validity of the investment case improves, typically with a stream of deals or collaborations, we would expect our valuation model to reflect the material upside that could arise. e-Therapeutics had £14.0m in cash in January 2017, which is down £10.8m on the £24.8m at FY16. However, we forecast that the cash burn will be reduced substantially in the coming years, reflecting the saving of the large costs associated with the previous clinical trials and with a more focused approach to R&D investing. The main operating cost in FY17 (year to January 2017) was R&D at £10.9m, having risen by 9.5%. R&D will remain the largest expense for e-Therapeutics going forward; however, we forecast that it will fall by 44% to £6.1m. 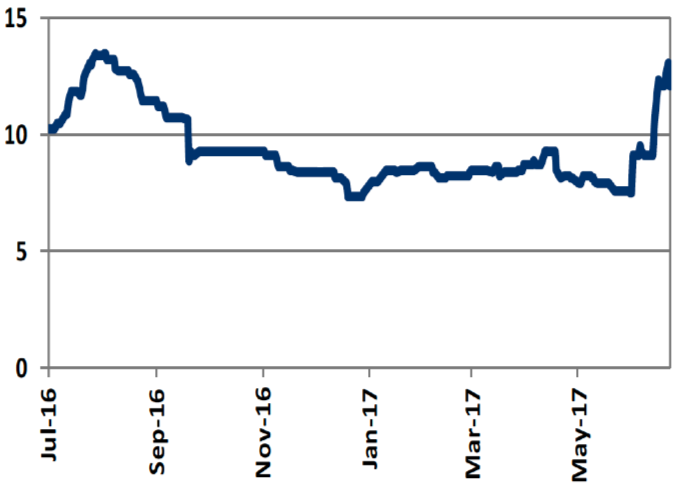 SG&A rose sharply by 64% to £2.6m, largely because of the management changes over the last year; we estimate that this will revert to historic levels at £1.8m per annum in the next two years. Overall, we forecast that operating expenses will fall by 42% to £7.9m in FY18, and cash burn to be reduced by 43% to £5.4m after taking into account the benefit of further R&D tax credits (~27% of R&D spend). This should enable the company to operate into 2019, while still being able invest in the discovery platform and programmes. The cash runway could be extended further by the formation of collaborations.